Your dirty, dusty windows could be why five p.m. sunsets make you want to retreat under a Snuggie. Grimy windows significantly limit the amount of sunlight that fills a space during short winter days. The lack of natural light can send even the sunniest of dispositions into hibernation. Whether you live in a fifth-floor walk-up or detached home, you don't have to spend another minute stuck looking out of dirty plates of glass. 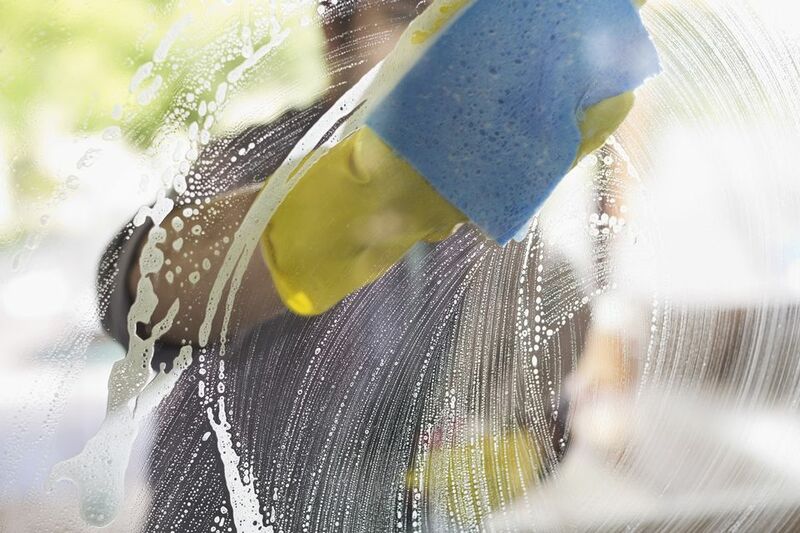 Here are five ways anyone can get their windows sparkling clean inside and out before winter. Cleaning the exterior side of windows that don't unlatch and lower into a room is no easy task, especially for apartment dwellers — unless you want to teeter dangerously on a window ledge. Or you can pick up a magnetic window cleaner that won't risk life or limb. Tools like these wash both sides of a window at once using microfiber cleaning cloths to wipe off any liquid cleaning product you decide to use. You can see how one works here. Folks who own these gizmos say it takes some practice to get the tool to glide smoothly. For example, pushing it around too quickly while cleaning can disconnect the magnets. A standard mop can make washing exterior windows a snap. Mix one part water to one part vinegar in a small bucket. Dip a clean microfiber cloth or mop head into the solution and attach to the mop handle. Scrub your exterior windows with the mop. Once most of the crud is gone, move on to next step. Spray a streak-free window cleaner onto the glass or on a clean microfiber cloth and wipe. Wait for the window to dry. Wipe the dried glass with newspaper for a streak-free shine. If your hands don't reach the window, you can skip this step. And most important, don't be a daredevil. For example, never climb out onto a window ledge or dodgy fire escape to clean your windows. You could scrub exterior windows from inside your home with a U-shaped telescopic pole. The set shown includes two cleaning attachments: a squeegee and circular sponge with two cleaning cloths. We gave this tool a try and were impressed that the handle extended our reach by around four feet. While the product works best on sliding windows as shown, it did remove most of the funk caked on our double hung windows. The last time our exterior windows were spotless was more than a decade ago when the prior occupant installed them. Things were going to get messy, so before getting started the window sill and the floor beneath was covered with a plastic drop cloth. Afterward, we vacuumed the window tracks. Any dust, dirt, and icky dead bugs that remained were wiped off with a damp microfiber cloth. Dry brushed the windows with a dry rag that covered the circular sponge. Eliminating some of the dirt this way first reduces the muddy mess a spray cleaner will create later. Spray the glass with several coats of Biokleen Window Cleaner. It's an eco-friendly product that cuts through yucky crud and grease much quicker than water and vinegar. Even better it dries to a streak-free shine. Wipe the cleaner from the windows using clean rags that you can slip over the circular sponge. Wipe off dust using a microfiber cloth or a disposable dust cloth. Vacuum each screen using a brush attachment. Mix one part water with one part vinegar and lightly spray on the screen toward the outside. Avoid a gooey mess by wiping off the solution with a rag immediately after spraying. Tip: Got a bathtub? You can rinse each screen one at a time after dusting and vacuuming in the tub using a hand held shower attachment. Hate washing windows? The Winbot by Ecovacs Robotics is a like a Roomba for vertical glass surfaces. The appliance debuted in the U.S. in 2013 to spotty reviews. Nevertheless, the latest model called the WINBOT 850 is a significant improvement. Equipped with a higher-speed fan motor, it cleans more efficiently using stronger suction that boosts stability. It's quieter too so you can do your thing at home without being distracted by annoying noise. Place the safety pod and harness that's attached to the machine on the inside of your window. It will catch the appliance if it falls. Attach the cleaning pad and spray with cleaning solution. So that you know, the appliance has two built-in squeegees. Before the gizmo starts cleaning, it scans the window to find out the best path to take. When the window is clean, the appliance will return to the starting position. You can see this ingenious gadget in action here.